Midfielder Jake Gray was a ‘victim of circumstance’ after he was substituted in the first half of yesterday’s 2-1 defeat to Colchester United, according to boss Nathan Jones. 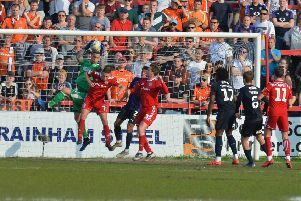 The 21-year-old was back in the side for his first action since the 4-0 win over Yeovil Town four games ago, but was visibly frustrated about being withdrawn on just 38 minutes for James Justin, after Luton had fallen 2-0 behind to Chris Porter’s double strike. On the decision to take Gray off, Jones said: “He was a victim of circumstance. We couldn’t get close enough to press and stop the cross, and when the cross came in, we didn’t defend it. “So we needed to change shape, which was against what we wanted to do and what we had been speaking about all week. “He wasn’t impacting the game, but no-one else was, so it could have been any single one of the 11 out there. Midfielder Lawson D’Ath, also back in the starting line-up for over a month, felt for his team-mate, but thought the change in style to three at the back, with Justin and Stephen O’Donnell to wingbacks benefited the visitors. He continued: “No-one was really setting the world alight in the first half, and it could have been anyone of us. “Unfortunately for Jake it was him. It could have been me, could have been Cookie (Jordan Cook), could have been anyone, but I think the change helped us tactically with their formation. Luton did look more comfortable after the switch and went on to dominate large parts of the second period, with Alan Sheehan denied by keeper Sam Walker and Justin’s effort destined for the top corner, wonderfully cleared off the line by George Elokobi. Jones continued: “The second half we were more like us, were urgent, created enough, got in final third, got in great positions, flashed the ball across the box, scored. “It’s a great control and technique from James to get it there and then we’ve had another kicked off the line, and a load of blocks, so credit to them, because they defended that. “We’ve had enough situations to have nicked something from the game as our first half performance didn’t deserve anything, but it gives us a little bit of heart the second half.